QUEZON CITY, Philippines, April 11, 2011 (ENS) – More than 135 public interest groups Monday asked the Philippines national government for a permanent ban on the pesticide endosulfan within the country. Through a petition letter, the groups also urged the government to actively back a global ban on endosulfan to protect public health and the environment. Led by the EcoWaste Coalition, Pesticide Action Network and the Global Alliance for Incinerator Alternatives, or GAIA, the campaigners urged tough action against the pesticide ahead of a crucial intergovernmental meeting that is expected to seal its fate. The Stockholm Convention on Persistent Organic Pollutants, or POPs, will meet on April 25-29 in Geneva, Switzerland to discuss matters related to implementation of the treaty, including the recommendation by a panel of scientific experts to ban endosulfan. The UN POPs Review Committee last year recommended the addition of endosulfan to Annex A of the treaty as a new persistent organic pollutant for worldwide elimination. “It is imperative for the Philippine delegation to bring to the meeting a strong policy position banning endosulfan, which has been linked to neurological disorders, mental retardation, congenital physical deformities, and deaths among community farmers and residents in developing countries,” said toxicologist Dr. Romy Quijano, president of PAN-Philippines. The AlerToxic Patrol volunteers of the EcoWaste Coalition’s Project PROTECT, which stands for People Responding and Organizing against Toxic Chemical Threats, brought the petition letter to the Department of Agriculture, where a picket line was formed. The petitioners asked Secretary Proceso Alcala to join with the nations that will soon make a historic decision to add endosulfan to the POPs treaty, which will eventually lead to its elimination from global use. “We can no longer turn a blind eye to the health and environmental hazards caused by endosulfan. It’s time for our country and the world to terminate this acutely toxic chemical pesticide,” said Manny Calonzo, representative of both GAIA and the EcoWaste Coalition. Among the signatories were: 2010 presidential candidate Nicky Perlas, former health chief Dr. Jimmy Galvez Tan, Mindanao statesman Senator Nene Pimentel, actor and playwright Roy Alvarez, toxicologist Dr. Bessie Antonio, pulmonologist Dr. Maricar Limpin, human rights lawyer Marlon Manuel, labor leader Josua Mata, climate campaigner Dr. Helen Mendoza, Sierra Madre advocate Fr. Pete Montallana, zero waste pioneer Dr. Met Palaypay, educator Dr. Leah Paquiz, Philippine Greens convenor Obet Verzola, and beauty queen Cathy Untalan. 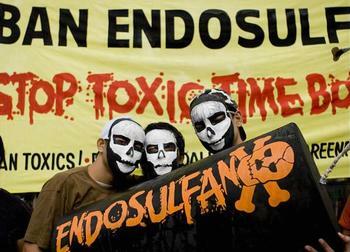 Numerous assessments of the human health and ecological risks of endosulfan by governments, academics and citizens groups, including testimonies from pollution victims, have confirmed the toxic, bio-accumulative and persistent characteristics of endosulfan, the groups said. 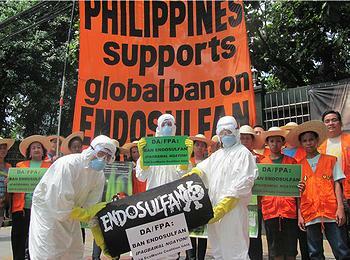 The groups told Secretary Alcala that the decision to ban endosulfan should be “easy, non-contentious and defensible” as the Philippines no longer has any registered uses for endosulfan. Del Monte and Dole pineapple companies, the only two entities previously permitted to import and use endosulfan, have switched to alternative pesticides following the deadly M.V. Princess of the Stars maritime tragedy in 2008 where some 10 metric tons of endosulfan went down with the ill-fated passenger ship. Over 80 governments, including the 27 member European Union and the governments of Australia, Canada, Indonesia, Malaysia, New Zealand, South Korea and Sri Lanka, have banned endosulfan or are phasing it out. But endosulfan is still used extensively in many other countries including India and China. Endosulfan is produced by Makhteshim Chemical Works, Ltd., Makhteshim Agan of North America, Inc., Drexel Chemical Company, KMG-Bernuth, Inc., and Hindustan Insecticides Ltd, among others.